Today's Ramble was led by Dale Hoyt. Today's post was written by Dale Hoyt. Today’s Focus: Looking at how trees grow. Today's Ramble was led by Linda Chafin. All the photos in this post, unless otherwise credited, were taken by Hugh and Carol Nourse, former leaders of the Nature Ramblers. Today's post was written by Linda Chafin. Today’s Focus: The Rock and Shoals Granite outcrop. Today's reading: No reading today. Announcements: The Garden is participating in a "Plantapalooza" plant sale this weekend (Saturday). Click here for the details and a link to the species offered. Today's route: Ramblers met today at the Botanical Garden and carpooled to the Rock & Shoals Natural Area off Barnett Shoals Road. 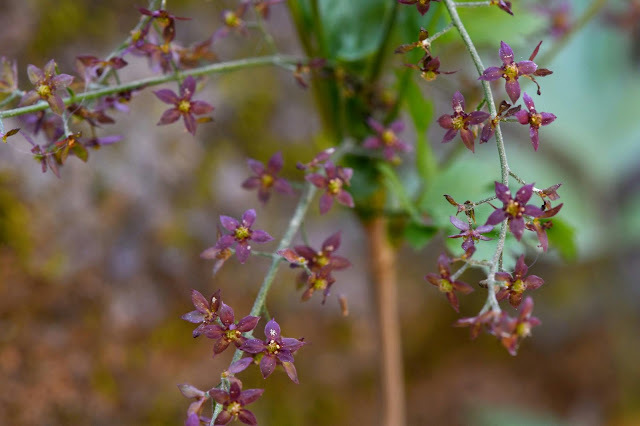 Mid-April is peak blooming season for the Piedmont granite outcrop specialties and endemics. Piedmont granite outcrops are found from SE Virginia to central Alabama, totaling about 12,000 acres, but 90% of them occur in the Georgia Piedmont. There are approximately 5,000 granite outcrops in Georgia larger than ¼ acre. Unfortunately, only 11 of them are protected, including Rock and Shoals (R&S), which is owned jointly by Athens-Clarke County and Georgia Department of Natural Resources. Though small, R&S supports many of the outcrop endemics and four rare species. Today's post was written by Dale Hoyt with assistance from Linda Chafin. A pre-Ramble treat: As we gathered in the Plaza, hundreds of Cedar Waxwings erupted from the nearby holly trees, milled about, flying back and forth over the Plaza, and suddenly departed. Gazing in the distance you will now see a long-awaited green mist, the stirring of tree leaves emerging from their buds. 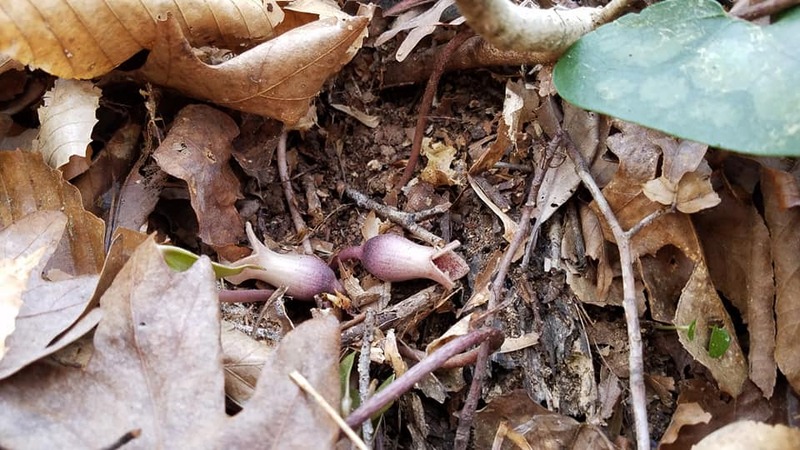 Soon we will be able to hear them rustling in the wind and this soft sound signals a change in the short life of the ephemeral flowers on the ground below. The closing of the canopy deprives them of sunlight and they must rush to produce their fruits and seeds and then retire until next spring. 1. 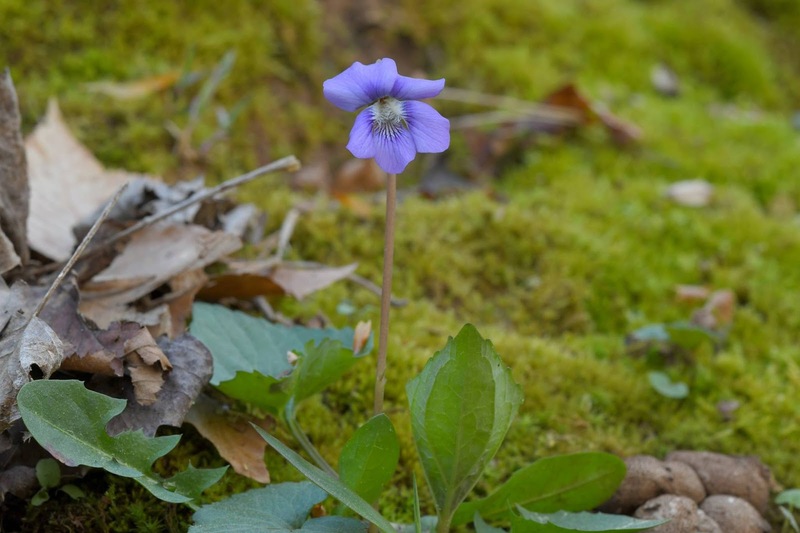 Next week the Ramble will be at Rock and Shoals Natural Area. Because parking there is limited, we will need to car pool. Meet at the Botanical Garden parking lot (near the Bus Stop shelter) at 9:00 A.M. and we will organize the car pools, 5 persons per car, then drive out to the Rock & Shoals. Please be on time!!! Stragglers will be left behind!!! We will return at approximately 12:00 – 12:30 p.m.
2. Halley said she has plenty of young shrubs and Painted Buckeye to give away...just come by to get them. 3. Dr. Ali invited all the Ramblers to the Open House at the Al-Huda Islamic Center, on Saturday, April 13, 2019, from 2 p.m. to 6 p.m.
4. Weds., April 17, 2019, Cine will screen a special showing of Hidden Rivers of Southern Appalachia. Reception (catered by The National) and Exhibit at 6:30, followed by screening and discussion at 7:30. Tickets are $5 per person and are available at the Ciné box office [or online at http://athenscine.com/movie/hidden-rivers]. Today's route: Through the Conservatory to the Orange Trail Spur. Down the spur trail to the Orange Trail and left on the Orange Trail to the parking lot. were seen all along the spur trail. 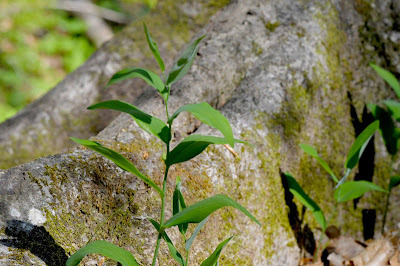 On our Ramble two weeks ago Don found the emergent leaves of Carolina Lilies. They were still here today and, with luck, will not be discovered by deer. 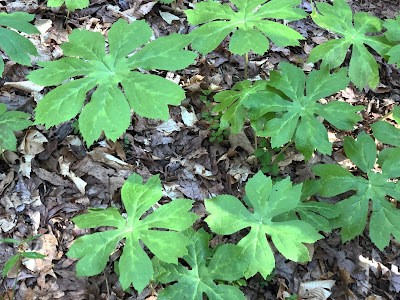 Mayapples; two weeks ago they were strongly mottled. At the turn of the path above the bridge there is a group of Mayapples we first saw on our March 21 Ramble. 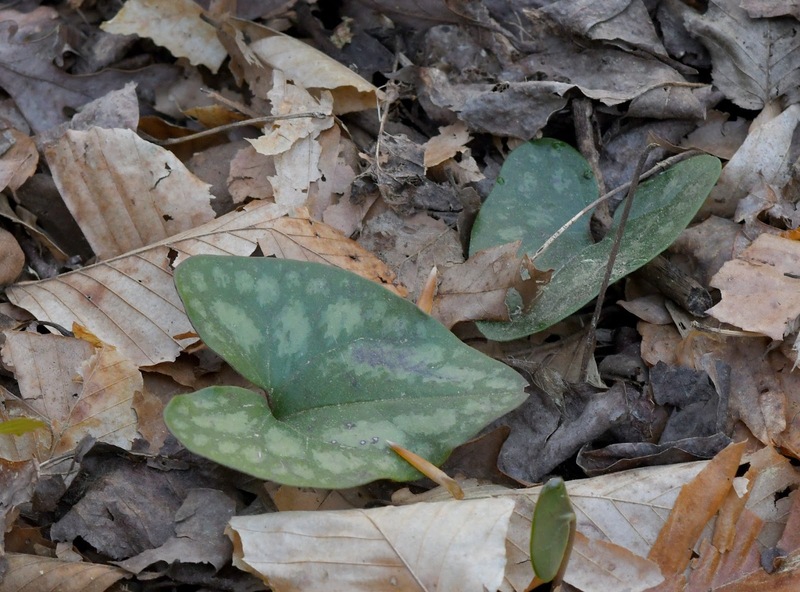 Then they were strongly mottled with darker green areas around the margins of the leaves. Today that mottling is far less obvious and many of the plants are infected with the Mayapple Rust fungus. Enlarged view of Mayapple Rust; the red-orange circular cups produce spores which will infect other plants. 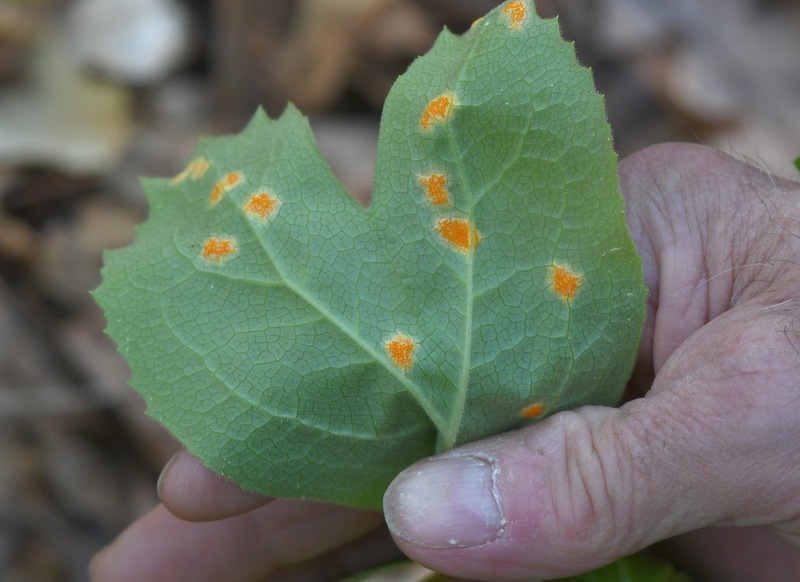 The granular orange patches on the undersurface of the leaf are produced by the rust fungus. They are where the rust spores are produced and released. (Rusts are important pathogens of plants and many rust species have complex life cycles that involve two or more host plant species. 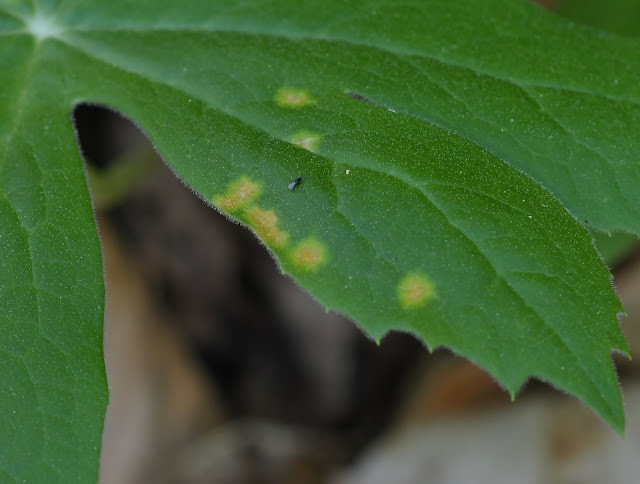 The Mayapple Rust appears to have a simple life cycle that does not require any alternate hosts. As the infection progresses it becomes visible on the upper leaf surface. 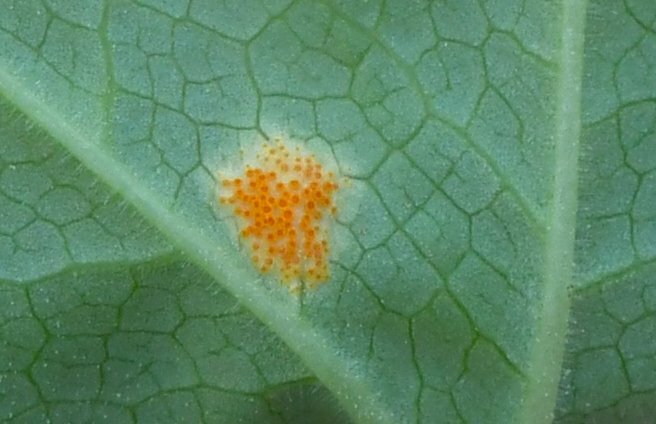 As the season progresses the effect of the rust infection becomes obvious on the top of the leaf: yellow spots appear where the rust is feeding on the leaf. Each Mayapple plant produces a single leaf per stem, except when the plant can flower. Then the stem forks about 6 inches above the ground and each branch produces a sing leaf. The flower bud appears at the fork. 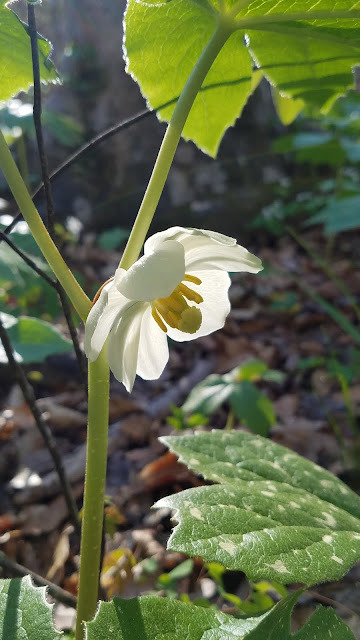 Two weeks ago we saw several plants with buds and today the beautiful white flowers are open. If pollinated, they will produce a fruit about the size of a lemon. 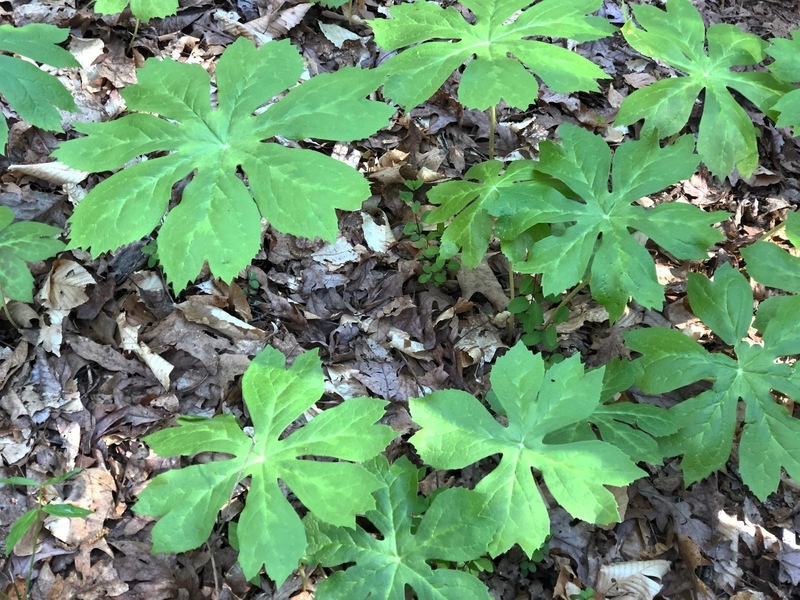 All parts of the Mayapple are poisonous, except the ripe fruit. (The unripe fruit and the seeds are poisonous.) Box Turtles are known to eat the fruit and, as a consequence, disperse the contained seeds when they defecate. The poison is podophylline and was once evaluated as a chemotherapeutic agent for the treatment of cancer. It proved to have too many side-effects and was abandoned. 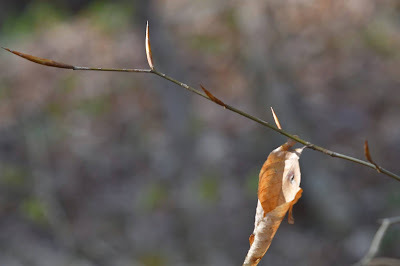 American Beech twig with sharp, pointed buds and last years leaf still hanging on. 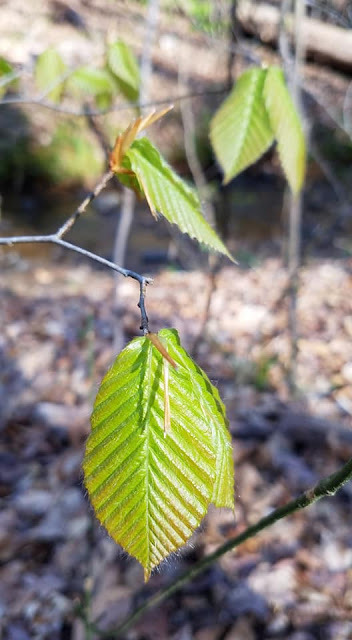 Freshly opened American Beech leaves; you can still see the remains of the bud scales that protected the shoot and its leaves during winter. Only a few of the young Beech trees have started to leaf out. 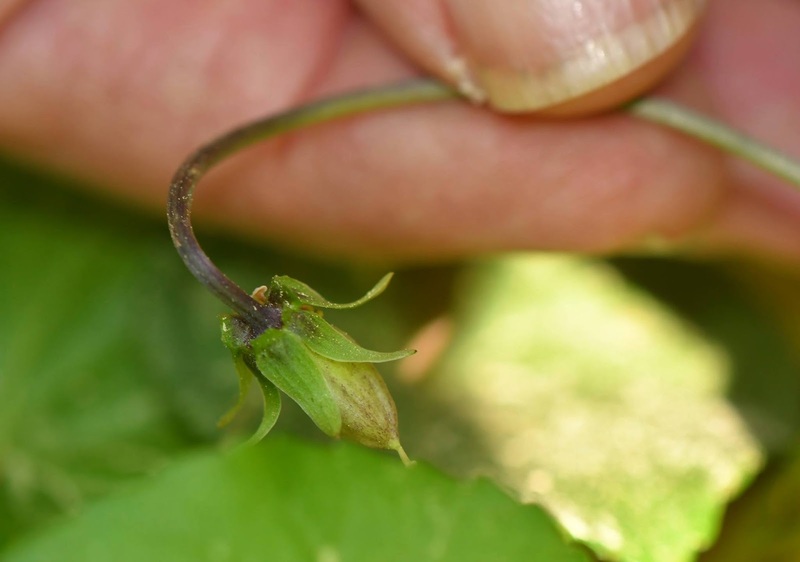 As the shoot within a leaf bud becomes active the buds swell and the bud scales separate and fall away. The shoot grows mainly by increasing the length of each cell, not by increasing the number of cells. This means that the embryonic shoot was actually formed in the previous year. 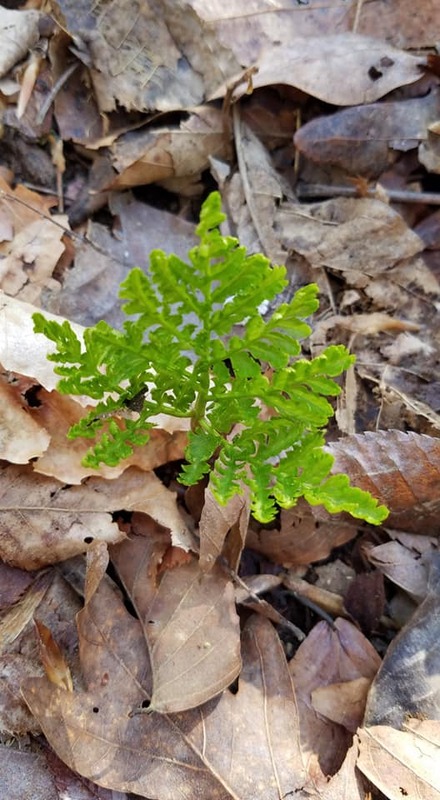 All the new spring growth is caused by cells absorbing water and swelling, the direction of growth controlled by how the cell walls are synthesized. The flowers of Little Brown Jug are unusual as they are found beneath several layers of leaves. If the purpose of a flower is to attract pollinators, why are these buried in leaves, out of sight of birds, butterflies and hummingbirds. 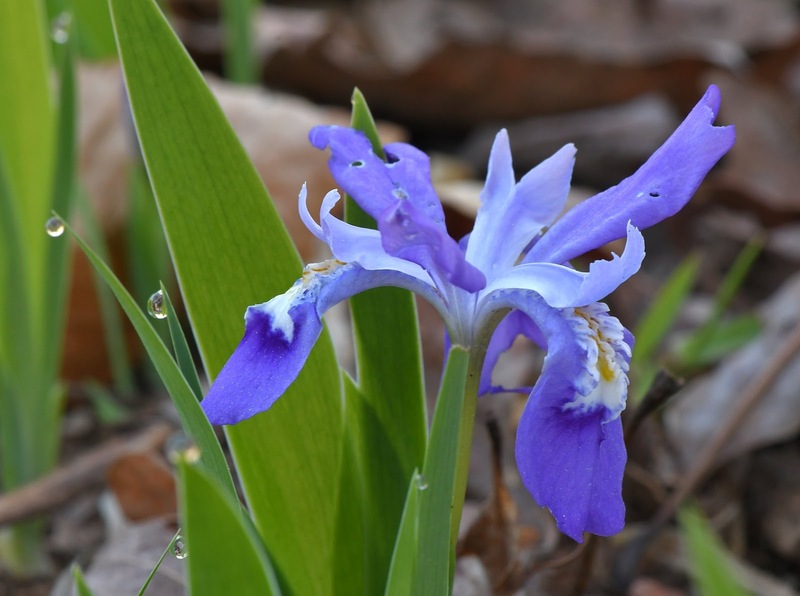 It is hard to determine what the natural pollinators of such plants are. Normally you could sit and count visits by bees or other insects, but in this situation you can’t see the flowers. And if you remove the leaf litter you may discourage the natural pollinators from coming. Other strategies must be used. 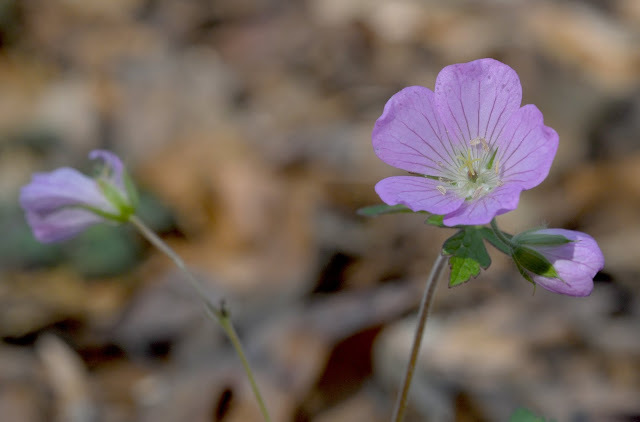 Emasculating the flowers by removing the stamens results in no seed set, suggesting that pollinators are not carrying pollen from other plants. That means that if pollinators are present they probably carry pollen from stamens to pistils within the same plant. This subject needs further investigation. Gynodioecy may be a stepping stone on the way to evolving into a species in which there are only two kinds of plants, those with male flowers and those with female flowers. That condition is called dioecious (pronounced: dye-E-shus). 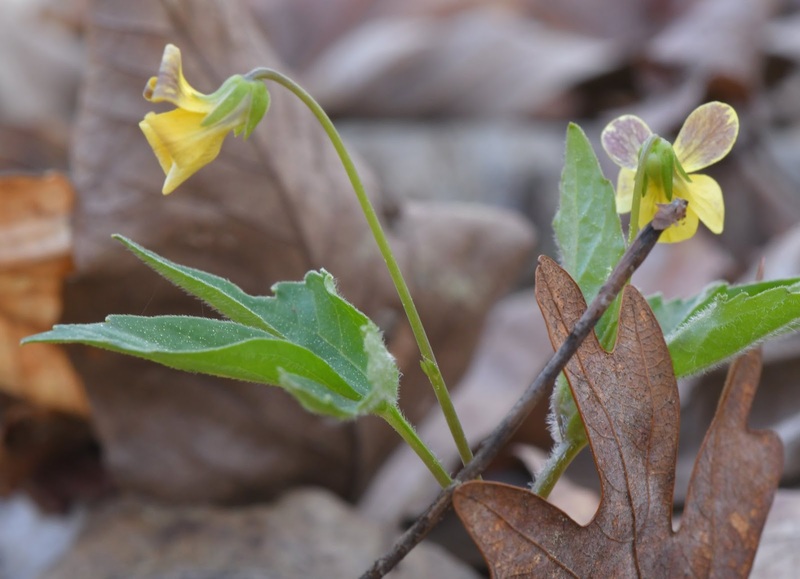 Plants have two ways of passing their genes on to the next generation: via seeds or pollen. If a plant loses the ability to produce pollen you would think that it would lose the evolutionary race to those that produce both. But making pollen takes energy and a plant that doesn’t have to make pollen can use that energy to make more or larger seeds. That could give it an advantage over the other plants with perfect flowers. 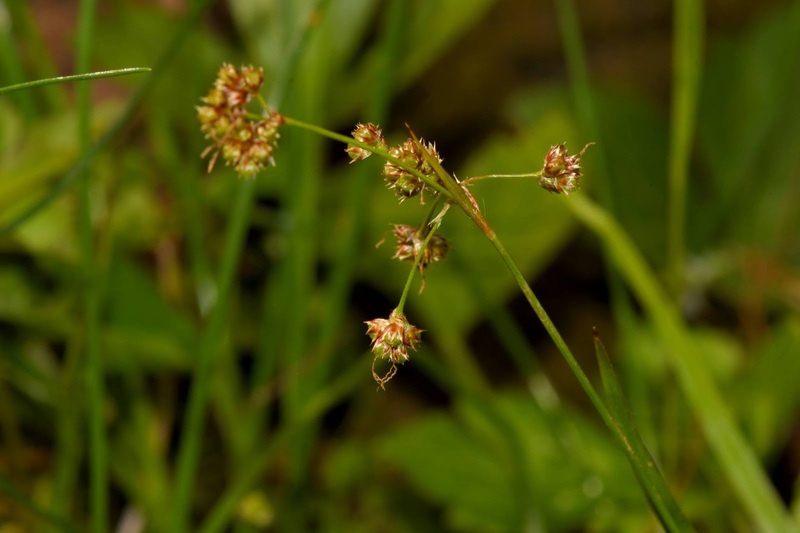 So, imagine that more and more of the plants in a population become female only and the number of perfect flowered plants declines. 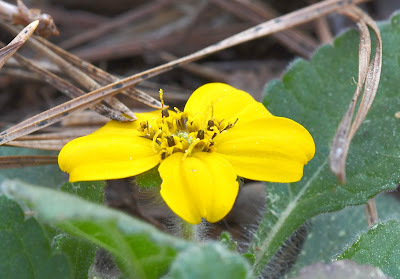 Eventually the population will reach a point where there are only a few plants with stamens and there is not enough pollen to fertilize all the potential seeds. 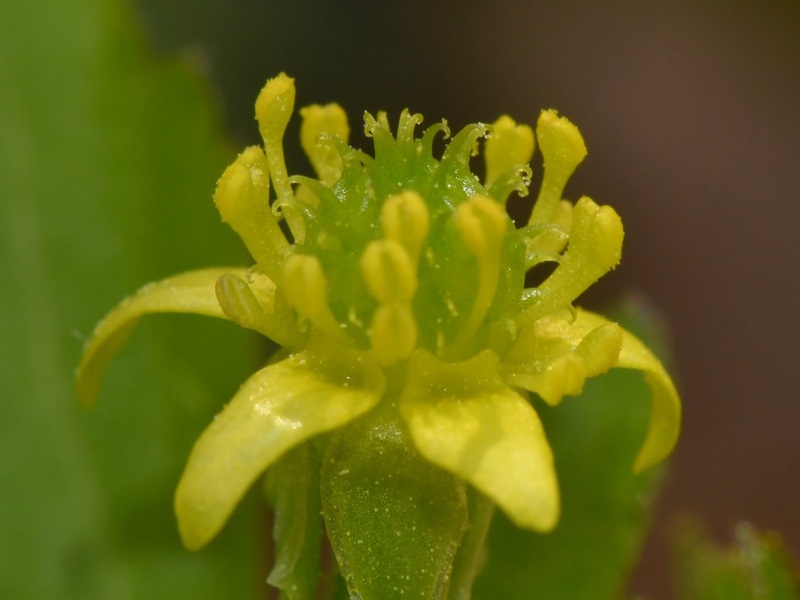 Now the plants that are producing pollen have the evolutionary upper hand and they will start to increase. It would seem to be pretty difficult to evolve into a dioecious species from a gynodioecious one. The tiny purple and yellow flowers of Yellowroot. 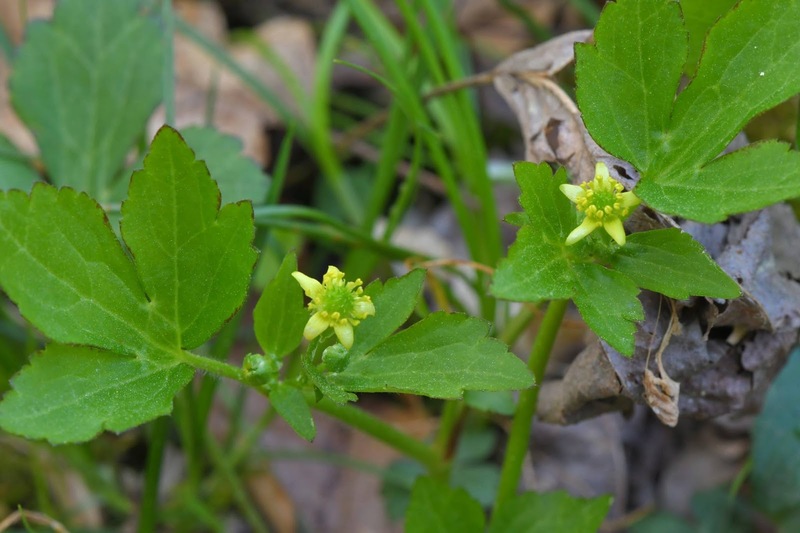 A Yellowroot shrub has been growing next to a stream-side boulder since the first Nature Ramble in 2011 and certainly before that time. 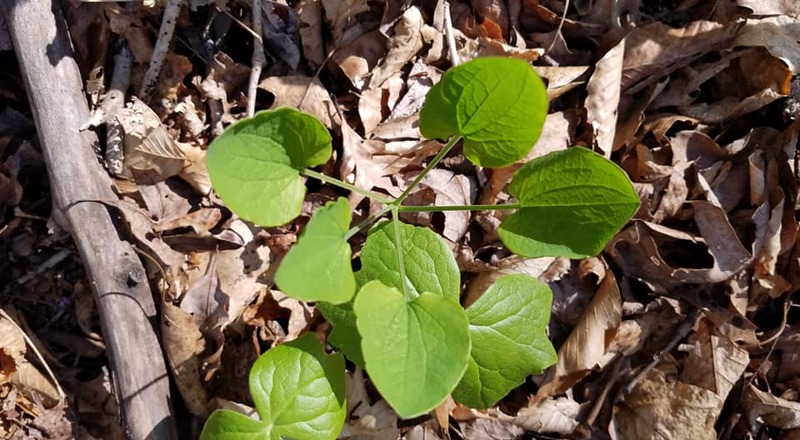 When most of us think of Smilax (and most of us don’t, usually), we think of the high-climbing, spiny vines called catbrier or greenbriar. Few people are aware that there are four species of herbaceous, spineless Smilax that grow throughout Georgia. 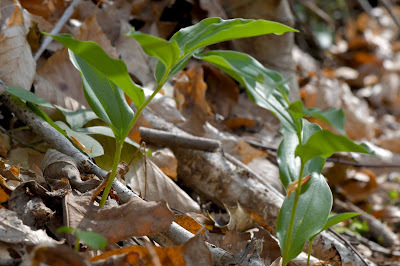 The one growing along the Orange Trail is Smilax hugeri, also known as Huger’s Carrion-flower. 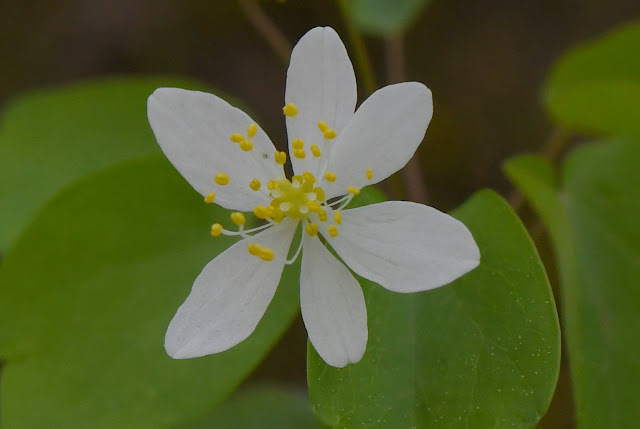 Its small, green flowers are held in round clusters at the top of the short stems and have a foul odor (hence the common name) that attracts pollinating flies and gnats. Cleistogamous flowers are not unusual, they occur in many plants, and are thought to provide reproductive assurance in the event that the “regular” flowers fail to produce seeds. 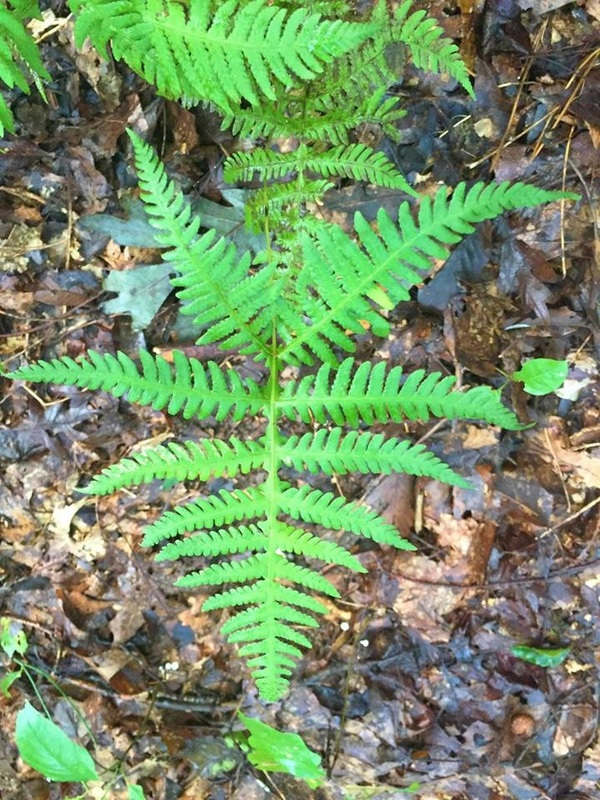 Mature Broad Beech fern, oriented so you can see the "fox's face." 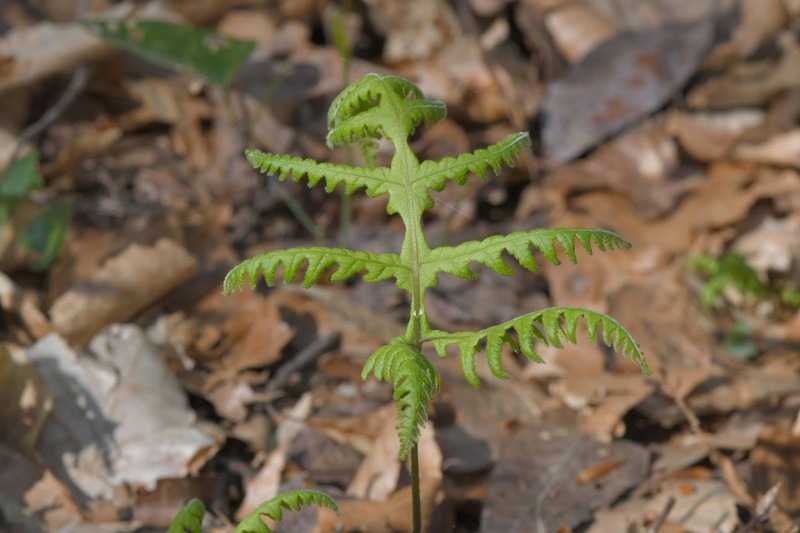 The tip of the frond is the nose and the two ears at the other end of the frond. Gary pointed out the roots of an American Sycamore that were growing out of the bank and across the rocks in the stream. 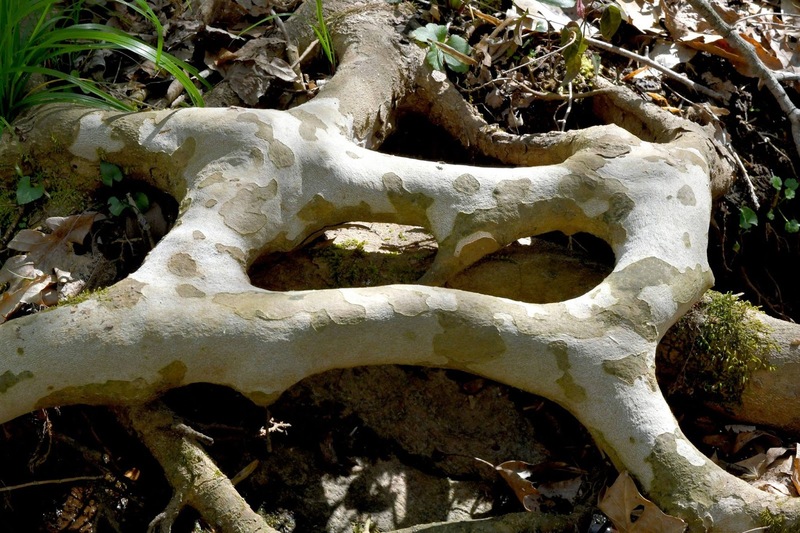 They had the same, blotchy pattern as the newer bark on the tree. 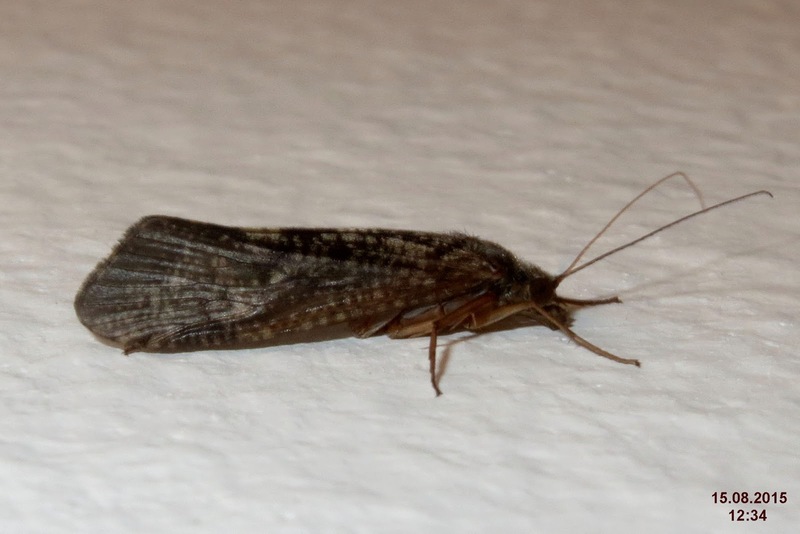 Most people have seen insects called caddisflies without knowing it. They are attracted to lights and you probably thought they were drab little moths. But their wings are covered with hairs rather than scales. 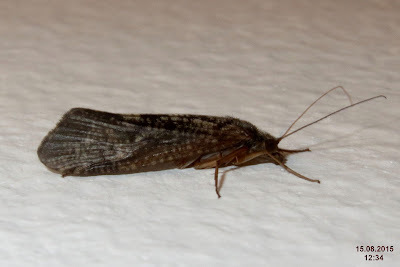 Like moths, they have larvae that look like caterpillars, but caddisfly larvae are aquatic, living in ponds, lakes, streams and rivers, where they mostly eat algae or decaying vegetation that they scrape off submerged objects. Many species make cases out of objects they find in their habitat: sand grains, small pebbles, small sticks, bits of plant material. The material is fashioned into a tube held together by silk spun from glands in the larva’s mouth. These cases protect them from predators like fish. The name comes from the hooks on the pistils. 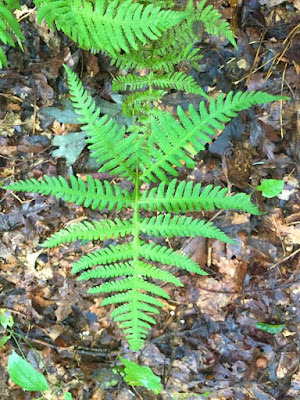 I have a Ph.D. in zoology from the University of Michigan and have taught a variety of biology courses in both universities and small colleges. My avocation is the study of insects, amphibians, reptiles and plants.